During our last visit to Bombay our friends suggested to have Gujarati thali for lunch and mentioned a restaurant name Golden Star. 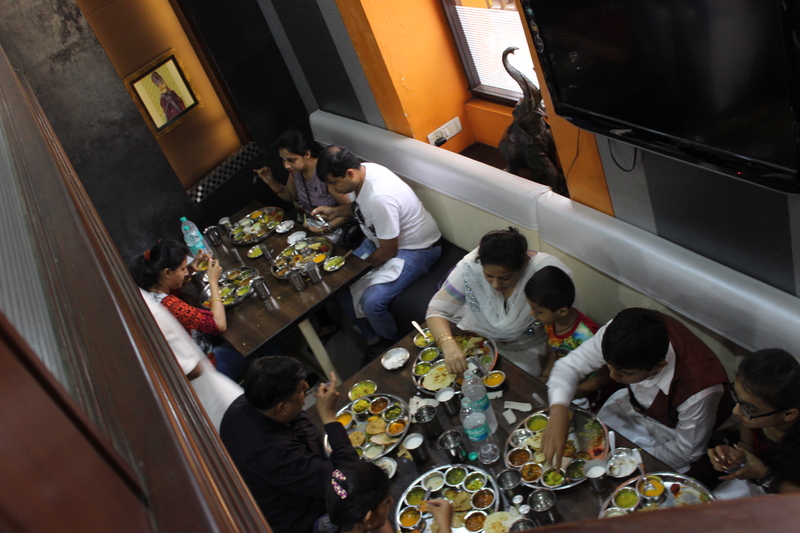 It did not take very long to convince us –another regional thali, another culinary experience. Sounds good to us! There are two Golden Star restaurants in Bombay, and we visited the one near Air India office. The restaurant seemed very popular, full of locals, and we were lucky to get a table after a few minutes’ waiting. We learnt that people are fond of this simple but cosy restaurant for good reasons: there is a specialty every day and the meals are unlimited. “We serve as long as you can eat” is written on Golden Star’s business card… Our friend ordered for us and we started to be showered by different thalis of outstanding variety, served by proud young boys. Everything looked amazing and we could not wait to take the first bite. The waiters kept returning to our table to bring more food, and it was a pleasure to watch them. The manager came to talk to us, too, explaining that most dishes are from Gujarat, but some one would find in Rajasthan, too. Eventually our plate (or should I say table) was full and our friend begun explaining what we were about to eat. A crash course to Indian food’s richness was about to start: dal bati (wheat rolls and lentils), kachori chaat (friend dumplings mixed with yogurt and chutney), spinach and corn curry, rajma (lentils and vegetables curry), shaak (Gujarati name for potato brinjal curry), and cauliflower and pea curry. 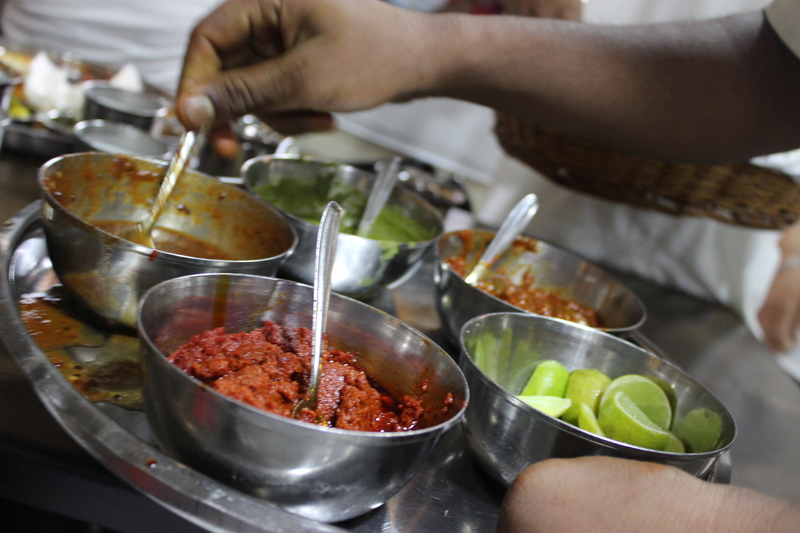 To add more complexity to the meal, we tasted every single chutney and pickle from coriander, tamarind and garlic chutney to mango pickle. Amazing and so tasty. But this was not all; then there were the breads! Bajra rotta (pearl millet flour), deep fried puri, papad, papadi and thin rotli with ghee. Each bread had its purpose, and had to be eaten with a specific dish. The magic of Indian kitchen. 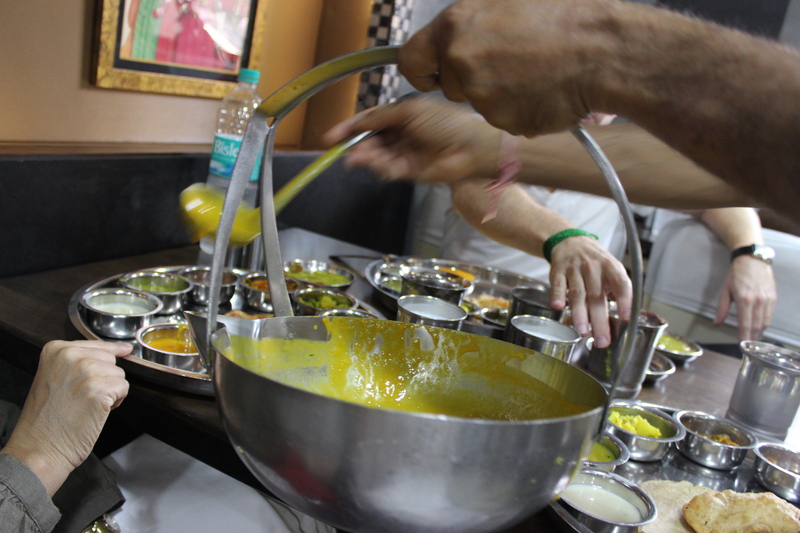 Oh, and then there was also the famous mango aam ras puree! The waiters kept serving us more and more, and we did not decline the offer… The meal included sweets (that were served at the same time in the beginning) but this is where my notes and memory get a bit blurry… We did have orange dholkla (steamed dumpling), batata vada (fried potato dumpling), sweet malpua (wheat-flour fritter fried in ghee and dipped in safron, sugar and syrup), but this is all I remember. I am sure I am forgetting half of the dishes we ate, and I am not in a position to explain how you should eat your Gujarati thali, but I do know that the waiters at Golden Star are very friendly! So, do exit your comfort zone of butter chicken and palak paneer, and experience a Gurajati thali. You won’t be disappointed! 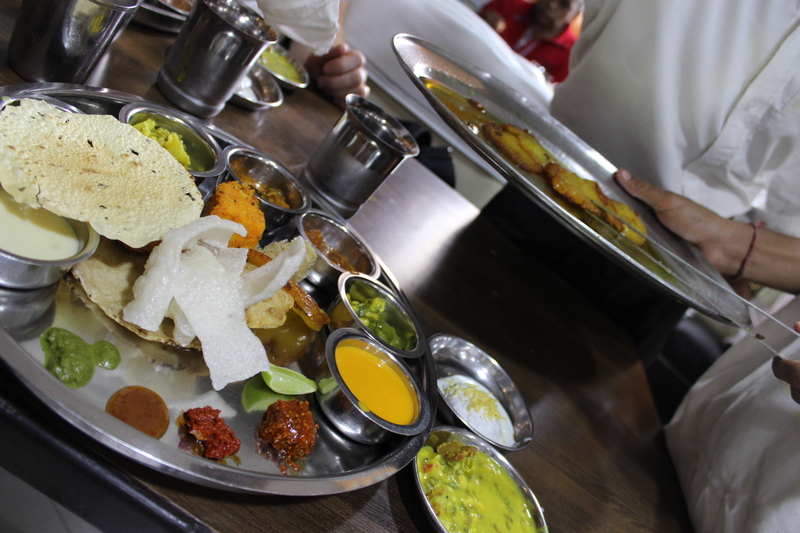 Note: Gujarati food is often vegetarian (many Jains live in that region) and a mixture of sweet, salty and spicy. The cuisine is known to be on the sweeter side (at least sweeter than other regional cuisines of India), but we did not really see any difference. I am not a big fan of sugar in general and I loved the food. This entry was posted in Uncategorized and tagged food, Gujarat, India, Jainism, Mumbai, Rajasthan, restaurant, South India on June 25, 2014 by Miia. 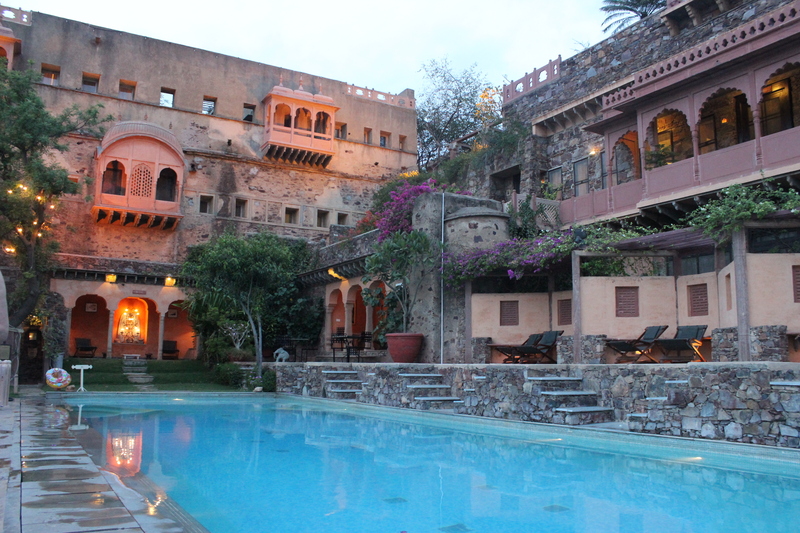 If you recall the India travel series I wrote earlier this year, you may remember that Neemrana Fort-Palace: the magnificent 15th century palace is one of my favorite hotels in the world. 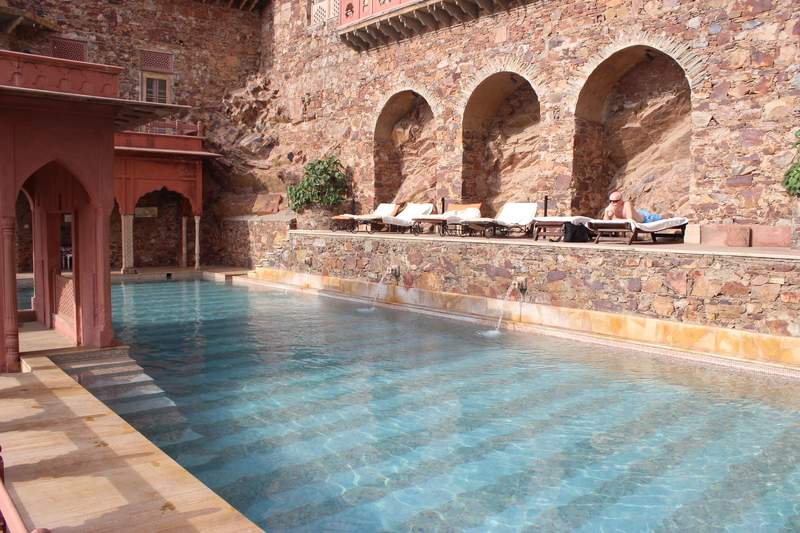 If I renewed my wedding vows, I would probably do it at the Neemrana Fort-Palace hotel. 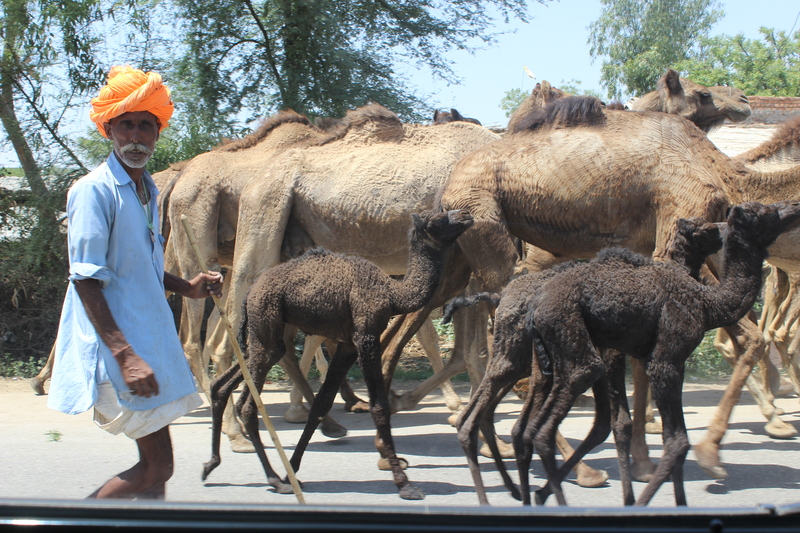 Right in the middle of history, charm, elegance and Rajasthani hospitality! 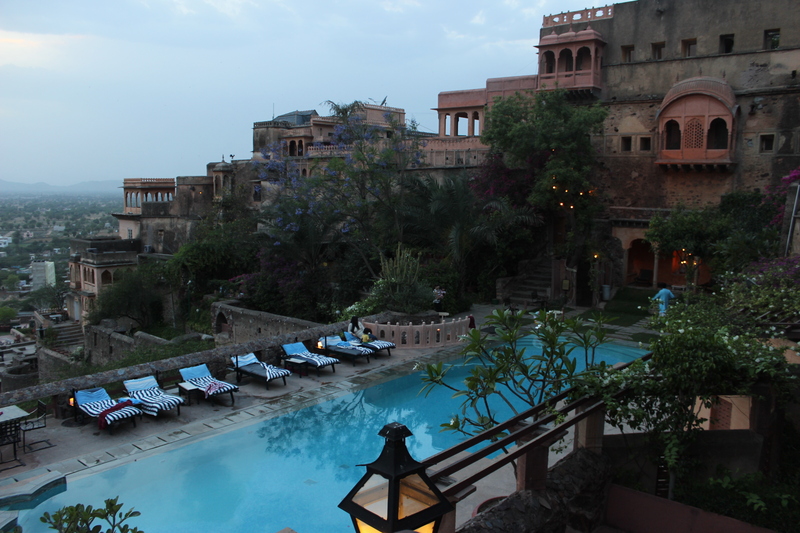 During my last trip to India in April this year I had a chance to return to Neemrana Fort-Palace for one night. It was a wonderful visit and we were pleased to realize that in spite of the extension works (there are now two swimming pools and 65 rooms) the hotel still feels very intimate. Just look at these labyrinths, verandas, patios and towers all over the property! At the time of our stay the hotel was occupied mainly by Indian families (most foreigners stop visiting Rajasthan by April as it gets too hot) so we had the upper pool to ourselves. In fact the original pool (at the lower level) can accommodate children, whereas the newer, upper pool, is reserved for adults. Once the sun started to set, we descended to the lower levels of the hotel complex. The view toward the valley was spectacular, and with a little bit of imagination we could have imagined a camel (or elephant?) caravan travelling in the horizon. Before heading to our lovely, comfortable beds in our Aman Vilas room we enjoyed an excellent buffet dinner with Indian Sula wine (red). It was my parents’ last night in India and I don’t think their stay could have ended in a more royal way. 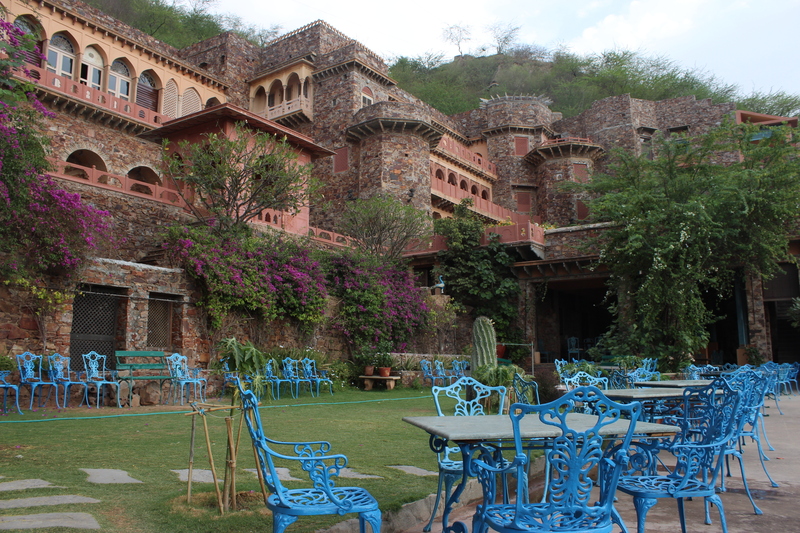 Neemrana Fort-Palace, hope to see you soon again! This entry was posted in Uncategorized and tagged architecture, art, design & decoration, food, hotel, India, North India, Rajasthan, restaurant, wine on June 16, 2014 by Miia. 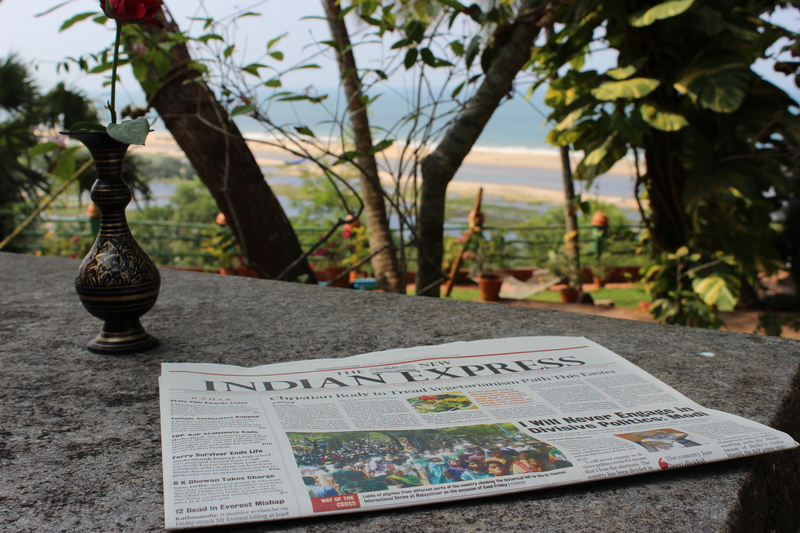 The first morning in Kerala. It was nice to sleep windows open, without AC. It is humid and hot, but only around 33C (not 40C as it was in Rajasthan and Varanasi). The only sounds entering our cottage are coming from strong waves that crash on the shore of the Indian Ocean, insects (yes, this is tropics) and birds. Lovely. We are staying at Somatheeram Ayurveda Resort, the highly-awarded first Ayurveda resort in the world where we spent a few night in 2010. 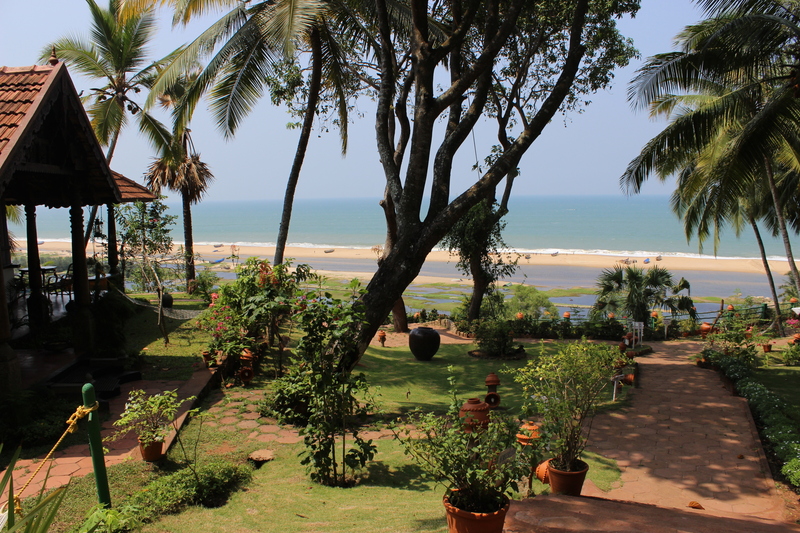 This time we wanted to return because the treatments had been very efficient and the location on a cliff overlooking the Indian Ocean is absolutely stunning, not forgetting the chef’s sublime Kerala food. So, here I am, resting my body, but also my ears and eyes. Southern drivers don’t seem to use the horn as much as they do in the north. Roads are quieter. 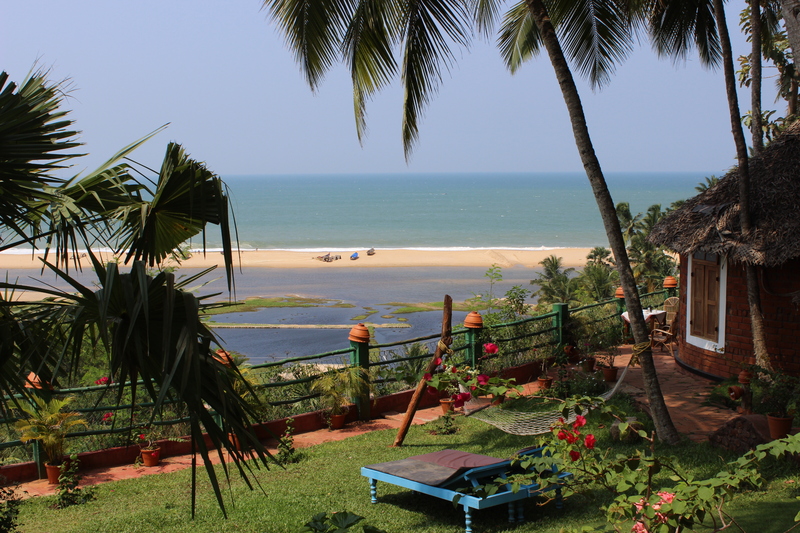 Kerala is very lush and green –no wonder it is called God’s Own Country. There are palm and banana trees all over and in addition, there is the vast sea in front of one’s eyes. Pampering and rejuvenation can begin! This entry was posted in Uncategorized and tagged food, hotel, India, Kerala, North India, Rajasthan, South India on April 19, 2014 by Miia. This trip in India is sort of divided into phases: few days in Delhi, ten days in Rajasthan, several days in Varanasi, precious Ayurveda time in the south and quality time with friends in Bombay. I planned to do more destinations but gave up. Gwalior, Orchha and Khajuraho will have to wait. I will be back sooner or later. Together with my parents I did Delhi-Agra-the Ranthambore Park-Jaipur-Pushkar-Neemrana-Delhi. As most of the places were familiar to me, I didn’t need to do a lot of research but it was still very time- and energy-consuming. I like making hotel reservations myself, I book tickets as I desire and when I like, etc. I very rarely use a travel agency. I like being free and for example to be able to change a hotel upon arrival if I don’t like it. I believe that I accumulate some valuable experiences by practicing this “philosophy” but at the same I acknowledge that this “freedom” takes a toll on me. 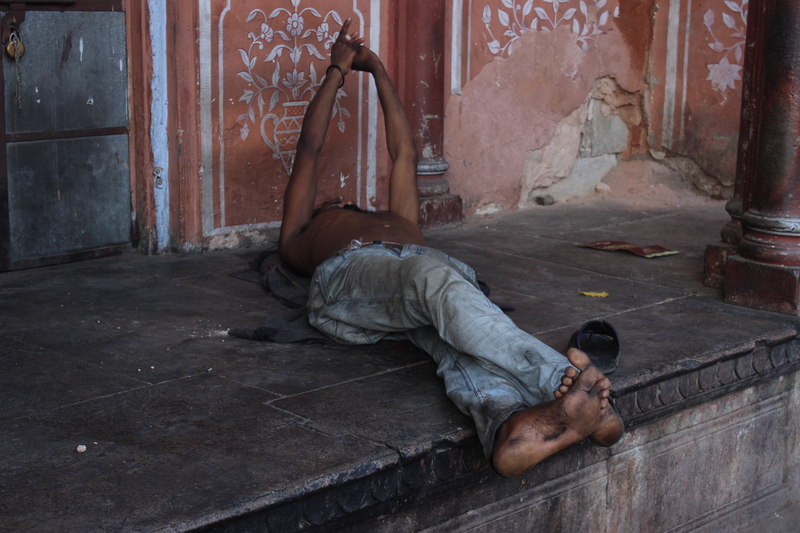 I have been in Varanasi since Sunday and I am totally drained. For example, what happened last Sunday, the day when my parents flew from Delhi to Dubai? The adventure begun! 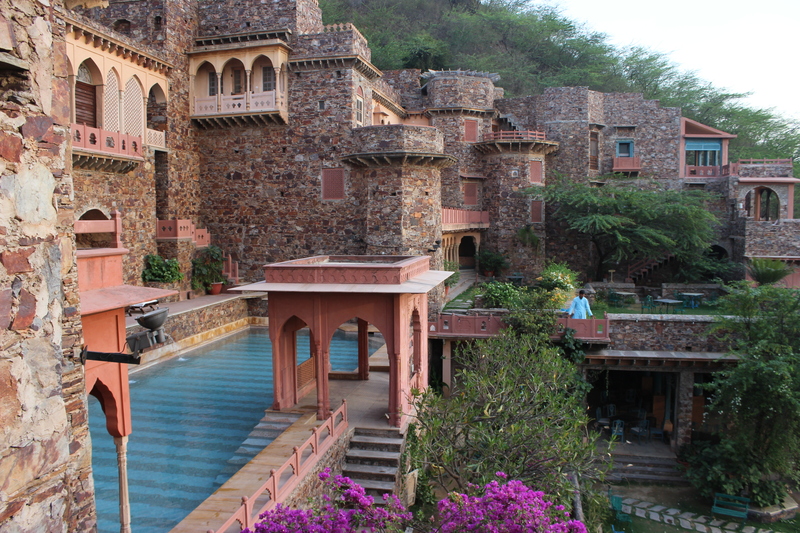 In the morning all of us drove from Neemrana Fort-Palace: the magnificent 15th century palace to the Delhi airport. After saying good bye to my parents outside their terminal (only valid ticket holders are allowed in) I asked my husband a question “what are we going to do now?”. I was feeling very weak, had a cold and some stomach problem, and all I wanted was to find a bed with nice soft cotton sheets. But we had no reservations and no Internet connection! Our only reasonable option seemed to be to spend some time at the airport and make calls, so we purchased tickets to enter the arrivals terminal (100 INR per person), ordered some drinks and sat down. 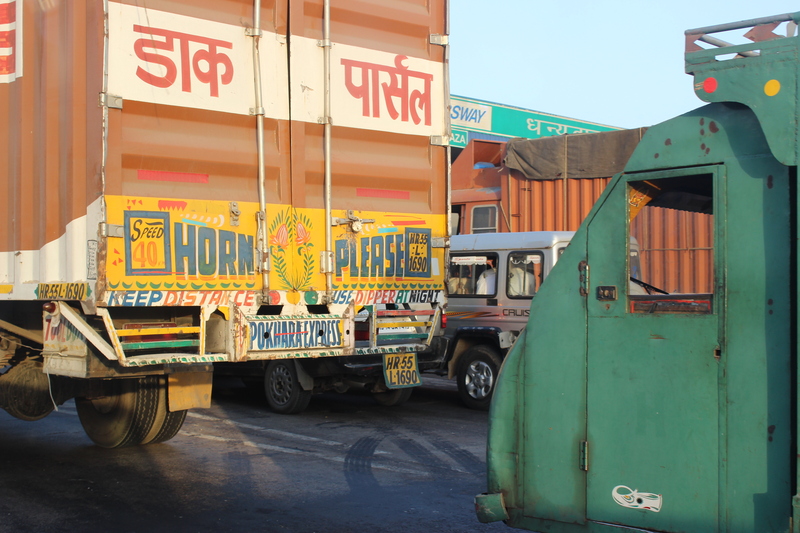 I made some phone calls to a car company I had had contact with, but the idea of a road trip from Delhi to Varanasi (via Gwalior, Orchha and Khajuraho) seemed very expensive in comparison to what we had had in Rajasthan, and I was not sure that I could handle any more of Indian roads at least during some days. After abandoning the road trip idea we went to an airplane ticket seller and asked for available tickets to Khajuraho and Varanasi. There were affordable tickets left but at this point I was feeling so sick that all I wanted was a bed to sleep in, so I told my husband to get a hotel somewhere near the airport. My idea was to have a good nap, eat some dahl and rice, sleep a good twelve hours and then return to the airport next day fresh to continue the journey. Well, this is what I thought was going to happen. 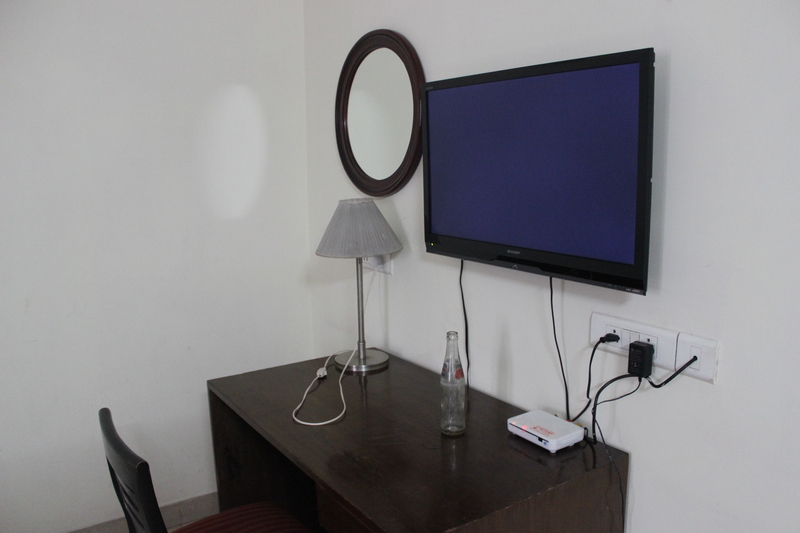 Upon arrival at an appalling Hotel Lohias about 4km from the Delhi airport I drunk a coke and took a shower. My husband checked the bed and the room, and called me to get out of the shower. You are not sleeping here, we were leaving… He didn’t think that the room was clean enough and the more I looked the more I agreed with him. 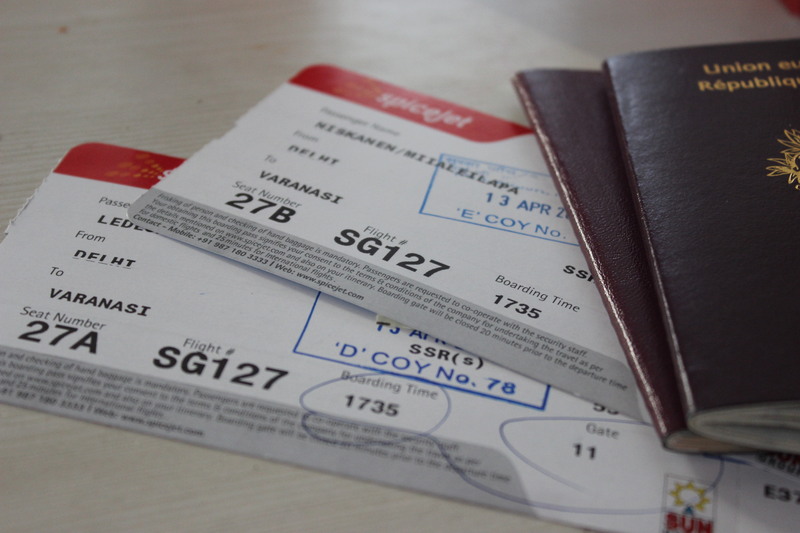 We did a bit of Internet search and found a flight leaving Delhi to Varanasi at 18h05 the same day (at the time of googling it was already 16h and we could not purchase tickets because it was too last minute). We rushed to the reception (we had already paid the room by a voucher), gave 30 INR for the coke, ordered the taxi and run to the SpiceJet counter. The service was very smooth and we paid 11,590 INR (around 145€) for two Delhi-Varanasi tickets and by 16h30 we had tickets in hand. See, most of the time things work out even if you leave it last minute and without a plan… Next we found a KFC (yeah, when you are sick you are excused!) and ordered a sandwich with a coke. Thirty minutes later we were inside an airplane flying from Delhi to Varanasi and the world was looking much brighter (well, we did not know what was waiting for us in Varanasi but that is another story!). Anyhow, I LOVE SPICEJET!! This entry was posted in Uncategorized and tagged food, Hinduism, hotel, India, North India, Rajasthan, religion, South India, Varanasi on April 16, 2014 by Miia. 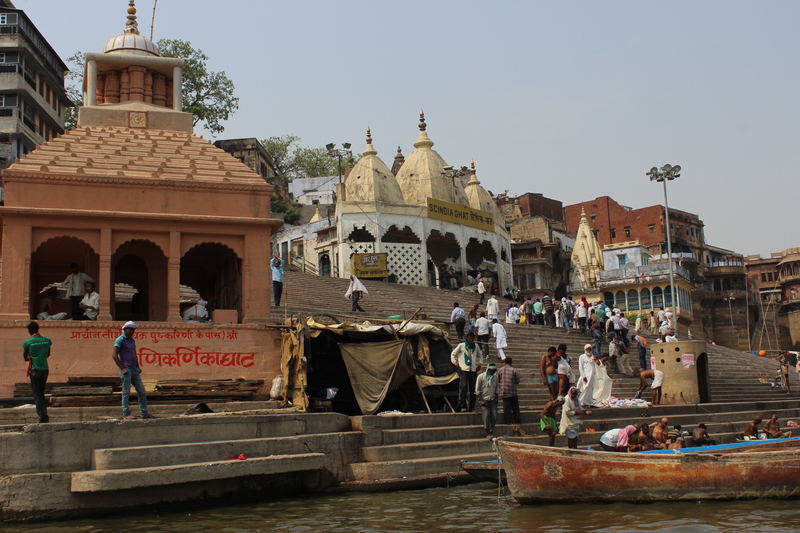 I took my parents to Delhi airport yesterday afternoon and after some to-be-told-later-on mishap (Blessing and curse of travelling without a plan) my husband and I finally arrived in Varanasi in the evening of the same day. The second part of the India tour started. 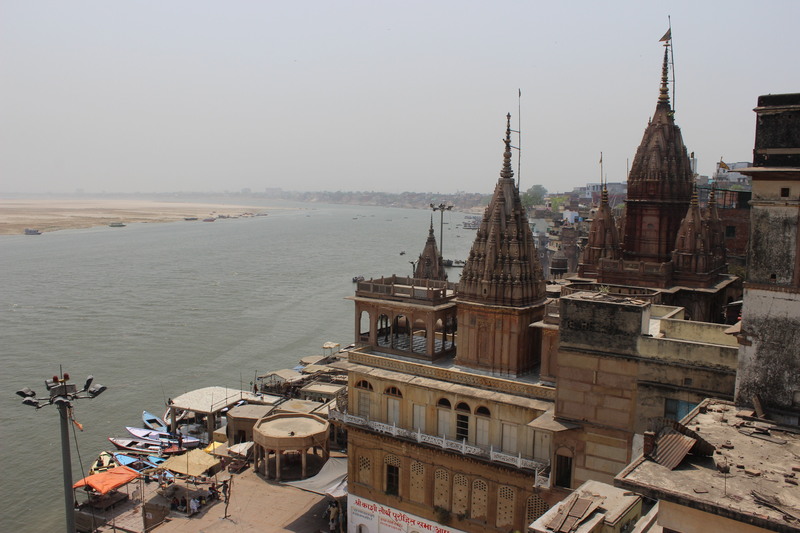 “Varanasi is older than history, older than tradition, older even than legend, and looks twice as old as all of them put together”. PS Following Pearlspotting on Facebook gives you short updates when I don’t have time to write a full post. Think about it next time you log in! This entry was posted in Uncategorized and tagged architecture, Hinduism, India, North India, Rajasthan, religion, Varanasi on April 14, 2014 by Miia. 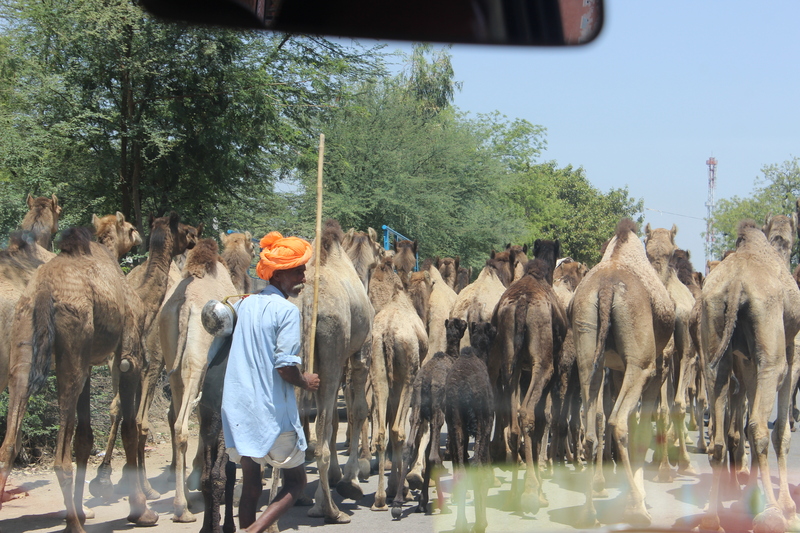 Two common sights in Rajasthani roads are overloaded trucks and camels. We passed by this camel heard yesterday. How exotic! Wonder where they were taking the camels? PS Love Rajasthani turbans!! This entry was posted in Uncategorized and tagged India, North India, Rajasthan on April 9, 2014 by Miia. 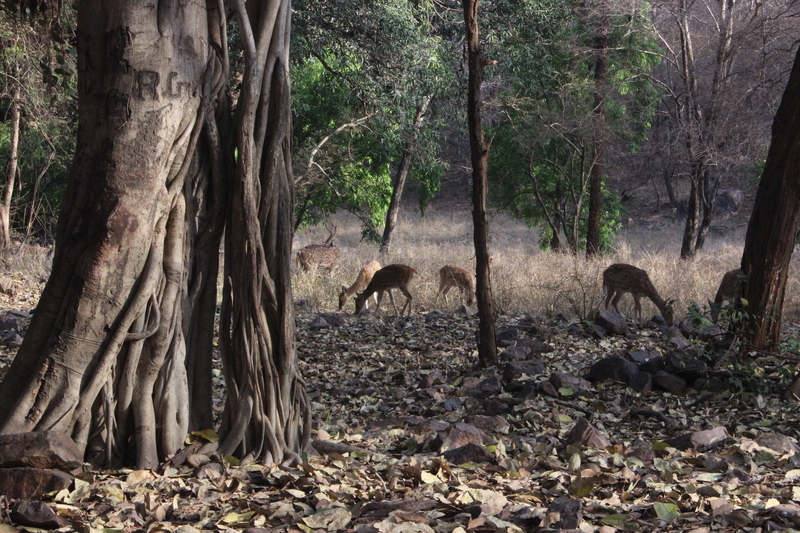 Ranthambore Park was originally used by Jaipur maharaji for hunting and it became a Tiger Reserve only in 1973. The number of tigers in the park has been increasing in the past years and today there are forty plus tigers (fyi: there are approximately 40 places in India where one can spot a tiger). 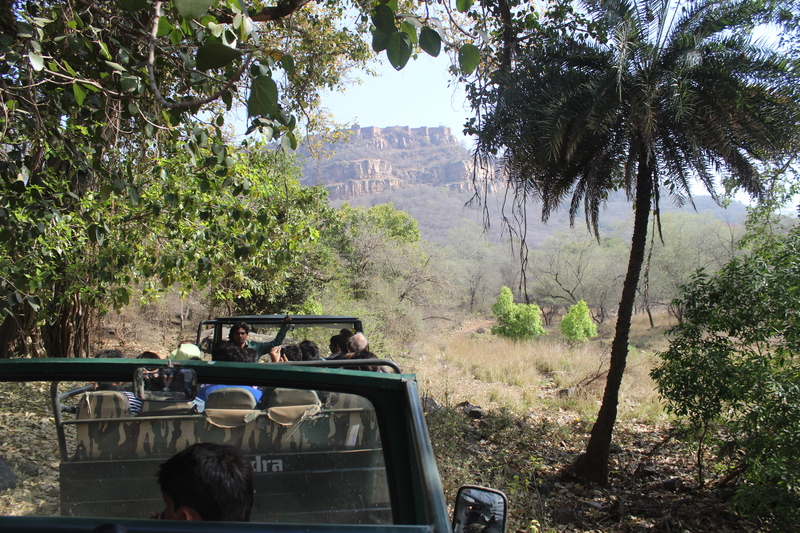 According to our guide, one has a 30% possibility of spotting a tiger in the Ranthambore Park. 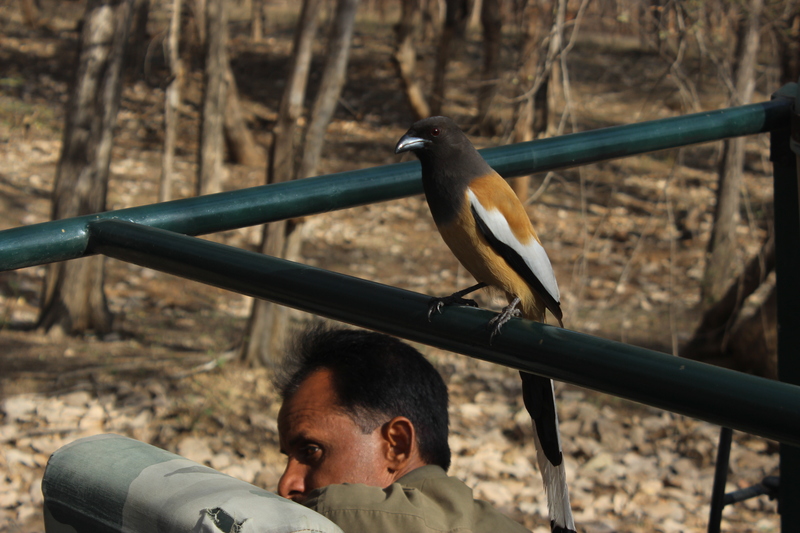 But even if one doesn’t fall under the lucky ones, the park is great for observing sambars, other types of deer, sloth bears, monkeys, crocodiles and many different types of birds to mention a few. In addition, in the middle of the park, there is a tenth century old fort and a Hindu temple that we did not visit, but they seemed very popular among the locals. 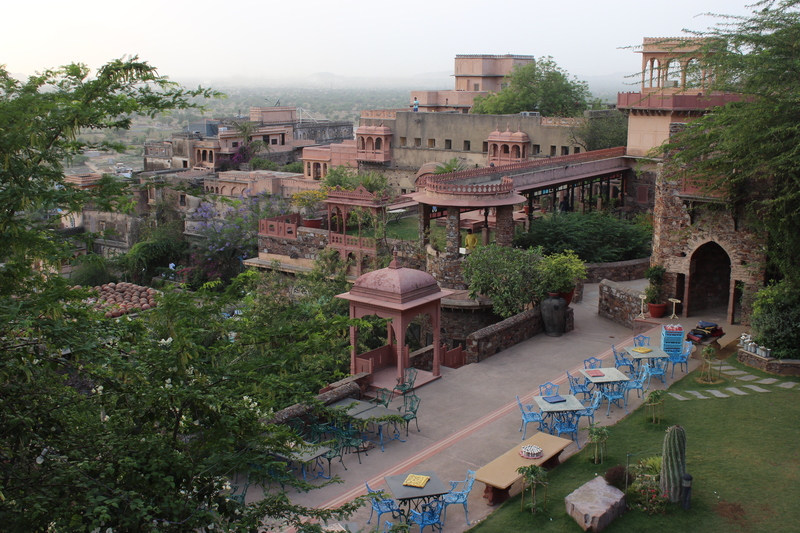 We spent two nights at Ankur Resort hotel near the park and did the morning safari. The car (for 20 people) left at 6 o’clock and we returned to the hotel at 10 o’clock. It cost 1100 INR (14€) per person. Immediately after the main gate there was a tiger resting in the grass and we waited and waited, but the tiger did not move. So, we did not really see a tiger, but some jeeps that were on the other side of the tiger saw it. It was a nice four-hour drive and I would do it again! PS According to our guide, the best time to see tigers is from April to July (the hotter the better). This entry was posted in Uncategorized and tagged Hinduism, hotel, India, North India, Rajasthan on April 9, 2014 by Miia.